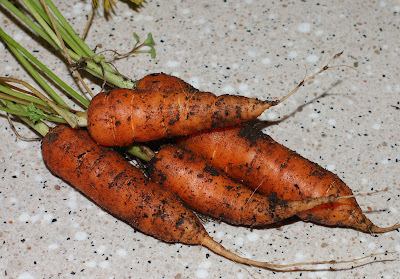 Carrots were the garden-grown guests of honor in my dinner last night. 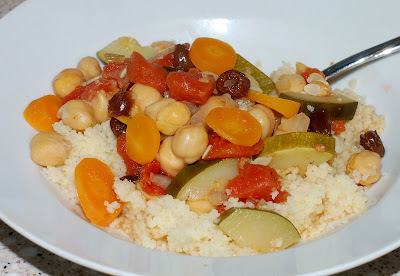 They mingled with a spicy-sweet mixture of ginger, cinnamon, coriander, cumin and raisins in a light and aromatic Moroccan Chickpea-and-Vegetable Stew. In the summer, I'll have my own tomatoes, garlic and zucchini to put in there... I hope! These are my photos for this week's edition of Green Thumb Sunday. Gardeners and nature lovers can join. Visit As the Garden Grows for more information and check here to see posts from other Green Thumbs. I love carrots combined with cumin. This sounds great! Those carrots look stunning both raw and cooked. Thank you for visiting. Another yummy looking recipe. And I absolutely love carrots. Where do ladybugs go for the winter?